Free snowman quilt patterns are simple and easy to download. Enlarge or reduce the size to create custom blocks and appliqués to add to wall hangings, table runners, comforters and pillow tops. Use scraps to stitch a carrot nose, muffler and top hat to your snowman and create a colorful and inviting winter sewing project. Snowman patterns is what NorthPoleChristmas is all about. 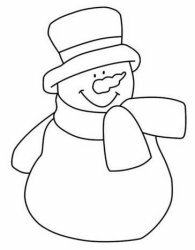 They have the cutest snowman patterns for wall hangings and applique..
Click on the snowman image at the left to view a printable pattern. Use your snowman quilt blocks with traditional quilt patterns to add a holiday flavor to winter quilts. Snowmen are cute and colorful appliqués to embellish children's shirts and home decorating accessories. Make holiday hot pads, placemats and towels for quick and easy Christmas gifts. Cute smiling snowman makes a 12" block. Snowman Block Pattern for a 12 inch quilt block of a handsome snowman in top hat and muffler. Snowman Quilt Pattern This quilt consists of there smiling faced snowmen each in coloful hats and matching mufflers. This is a wall hanging with 3 snowman faces. Warm & Cozy Snowmen Quilt pattern of three snowmen wearing stocking caps and mufflers all cozy under a blanket. Starry Night Snow Family Quilt pattern of three snowmen gazing at the starry night sky above their heads. Holy Night Snowman This is a quilt block that measures 19.5 inches square of a snowman under a bright star in the night sky.